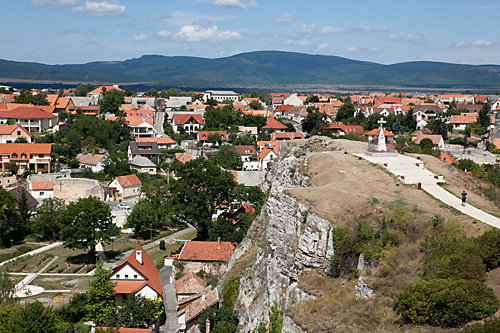 The town of Veszprém is situated in the Transdanubian part of Hungary, on the border of two regions, between the Bakony Hills and the Balaton-uplands. 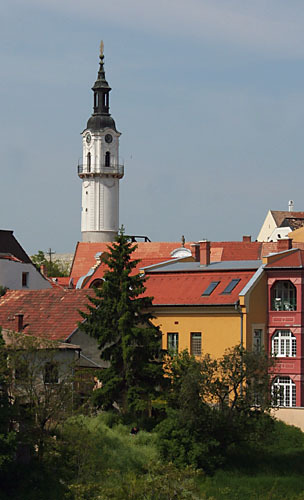 Veszprém is built on a ridge. The Brook Séd divides the land into low hills, and that is why the town is said to be built on seven hills: Várhegy (Castle Hill), Benedek-hegy (St. Benedict Hill), Jeruzsálem-hegy (Jerusalem Hill), Temetőhegy (Cemetery Hill), Gulyadomb (Herd Hill), Kálvária-domb (Calvary Hill) and Cserhát. Twisting, narrow streets, tiny houses and flowery gardens are the main characteristics of the town. The thousand-year-old history of the town is concentrated in the Castle. Here is the residency of the Archbishop of Veszprém, in the spectacular baroque-style Bishop’s palace, built in 1767. The Archiepiscopal Archives can also be found in the building, where almost 2000 documents are housed from the 11-14th century. These ancient documents are really precious especially for researchers, who can get information about life through the ages and details of the inhabitants of the surrounding villages. The remains of St George’s Chapel is a monument of national importance on the north side of St Michael’s Cathedral. The relics of the head of St George had been stored here, attracting thousands of pilgrims. The cathedral itself is the central building in the area and in addition to holy masses, concerts and wedding ceremonies are also held here. 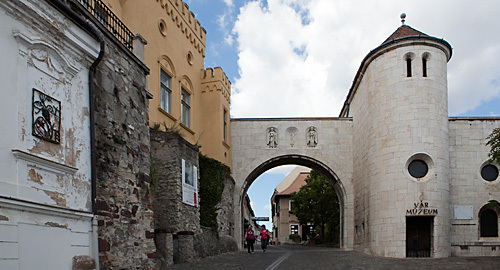 The now Neo-Romanesque Church is mentioned in the charter of Pannonhalma of the year 1001. There is a story about the construction of the cathedral, which also gives an explanation of the town’s name. Legend has it that the fortune of King Stephen I ebbed away during the building, so Queen Gizella decided to contribute to the expenses herself. She threw away her fur coat ornamented with precious stones and said ‘Vessz prém!’ (‘I let fur lose’) with which she wished to symbolize her giving up a luxurious way of life for the sake of the completion of the cathedral. The cathedral served as an important centre of the music life of the Transdanubian region in the 18-19th century. Famous European composers’ (Mozart, Haydn, Beethoven) pieces were presented not much later than their world premieres. 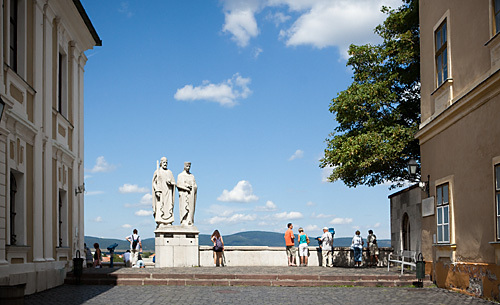 From the parapet, where the attractive statues of King Stephen and Gizella were erected on the 900th anniversary of King Stephen’s death, there is a good view of the north-western part of Veszprém. In the narrow valley one can see hundreds of tiny houses, along with the ruins of the medieval Dominican nunnery named after St. Katherine. This place is also called Margaret-ruins as Margaret, the daughter of King Béla IV was brought up here until the age of ten. The monastery fell victim to the Turkish conquest. Unfortunately only the basement wall and a part of the wall of the church, excavated in 1938, are visible today. The view from the Fire Tower at the gate of the Castle is fascinating. After the Turkish times the tower was rebuilt for a new purpose: a guard had to watch the city and signal when a fire broke out. Its music clock plays a popular tune every hour. This tower is one of the symbols of the town. Next to the tower there is the former Fire Station, built at the very beginning of the 19th century. A short inscription can be read on the façade referring to the original function of the building: “This house was built at the inhabitants’ expenses to store fire-fighting equipment”. Leaving the Castle area an old Veszprém house can be seen, the so-called Pósa house. The name is taken from that of a printer and bookseller who once owned the building. The Copf style, two-storey building was originally built for the Cistercian order in 1793. On the ledge are vases and two coats of arms. The symbol of the Cistercians is on the left. Not far from here there is another Copf style building, the Kapuváry House, which housed the Town Hall until the beginning of the 1990s. Today’s Town Hall rises on the north-western end of the triangular square. The neighbouring house is the former Veszprém Savings Bank, which was founded by the inhabitants of the town in 1845. The building of the oldest restaurant of the town can be seen opposite the Kapuváry House. Besides the silent remains of bygone days, the Petőfi Theatre attracts thousands of visitors throughout the year. The Art Nouveau building was built in 1908. It was the first large building in Hungary to be constructed entirely from reinforced concrete. A notable feature is the circular stained glass window at the front. In the park next to the theatre rises the recently renovated Romantic-style building of the County Library named after Károly Eötvös. The house was originally constructed for the management of the bishop’s estates, and it now it forms an integral part of the University Town. In Erzsébet Sétány, not far from the County Hall stands the Dezső Laczkó Museum. The name comes from its founder and first director. The exhibitions cover the general history of the region including an archaeological and folk art display. A few metres to the right of the museum there is the so-called Bakony Regional Folk House. It was built in 1935 in the style of a house in Öcs, a village near Veszprém. With its thatched roof and veranda it was considered a very modern one at that time. Inside are items relating to the local peasant way of life and work. The Kálmán Kittenberger Botanical Garden and ZOO Park – named after the famous Africa-traveller, Kálmán Kittenberger – can be found in Fejes-valley. The park opened in 1958. With grounds of more than 10 acres, it houses 120 species and some 450 animals. Besides species that can be found in every zoo, the park has some zoological rarities, like Sumatran tigers, caracaras and the so-called David-deers. Above Fejes-valley, on Gulyadomb there is the park which shelters typical Hungarian animals and a Riding School. The aim of the animal-park is to reintroduce once well-known, today forgotten Hungarian species, like the Hungarian grey cattle, black and white Hungarian sheep and typical Hungarian sheepdogs – puli, pumi and mudi. 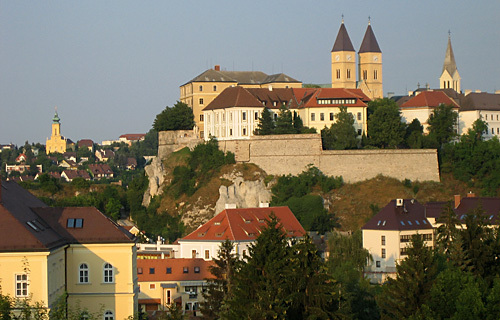 Besides historic sights and cultural programmes, Veszprém offers recreation for nature-lovers as well. There are countless hiking-routes in the Bakony Hills and several educational paths can be found in the territory of the Balaton-uplands National Park. In the basins and valleys, among the Bakony Hills, tiny villages attract people loving nature and leaning towards romance. 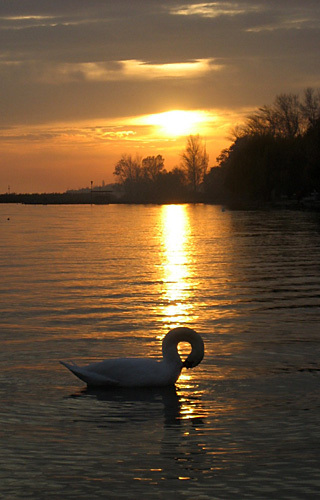 Lake Balaton the largest fresh-water lake in Europe lies 14 km to the south of Veszprém. Although I was not born in Veszprém – I came here only in 1984, after finishing my university studies – my children were already born here, and now I feel to be citizen of Veszprém. I think we live at one of the best places of Hungary. This is partly due to the superb environment, but partly also due to the historic splendour of the city. It is the city of the Queen. The capital, Budapest, is only 120 km away. Despite this we live in a quite smaller city of the country. The lake Balaton and the hilly region of the Bakony are beautiful in all seasons. In the Autumn the red, yellow, green and brown leaves of the trees provide a gorgeous landscape, in Winter the frozen surface of the Balaton is breath-taking, allowing the possibility to skate along the shore. From Balatonfüred, crossing the bay of Tihany, one can reach the peninsula on ice. In Spring, when the ice starts to break, crevasses are formed and huge mountains of ice pool together at the shore of the lake. But the ice soon melts and the new Spring brings thousands of blossoms of splendid colours on trees and flowers in the meadows. During the Summer our part of the country is a real recreation area: you can swim, sail, surf on the Balaton, or hike in the mountains. I tell my sons frequently that we have everything here, our home is in a superb place. I am glad to be an inhabitant of Veszprém, and hope that our guests will feel themselves welcome in our city, and will take home some nice memories of their trip.